Union City, Tenn.—Union City Police have released a description and video surveillance photos of the suspect who robbed the Pocket’s Store at gunpoint early Sunday morning. 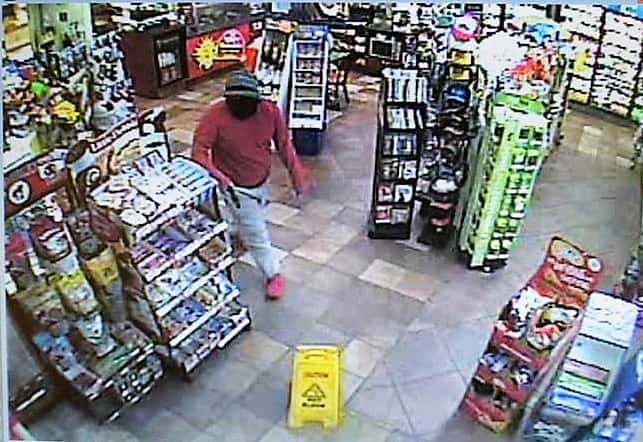 The unidentified man entered Pocket’s Shell Station at 1605 West Reelfoot Avenue around 4:15 a.m., then proceeded to point a gun at the store clerk and demanded all of the money from the cash register. According to the police report which was released earlier, a total of $1,141 was stolen. The unknown male is described as being approximately 5’8″, wearing a red long sleeve shirt, gray sweat pants, and red tennis shoes. The subject also wore a black cloth face mask under a light brown toboggan. A possible vehicle of interest is a newer model, white, 4-door sedan; may possibly be a 2015-2018 Hyundai Elantra. If you have any information regarding this crime please call the Union City Police Department at 731-885-1515. You may also call Obion County Crimestoppers at 731-885-8477.